“The health and hygiene category is complex and multifaceted,” stated Mario Natarelli, partner at MBLM. “The industry itself creates intimate products we use in or on our body, yet it doesn’t translate into intimate brand relationships." MBLM, the Brand Intimacy Agency focused on strategy, design, creative and technology, today revealed that the health and hygiene industry ranked ninth out of 15 industries, following apparel and fast food, in its Brand Intimacy 2017 Report. The report, which is the largest study of brands based on emotions, found that within the category Olay placed first followed by Dove and then Crest. Brand Intimacy is defined as a new paradigm that leverages and strengthens the emotional bonds between a person and a brand. According to the 2017 report, top ranked intimate brands continued to outperform the S&P and Fortune 500 indices in both revenue and profit over the past 10 years. 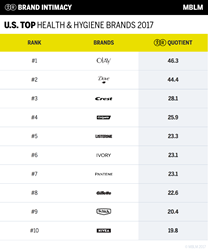 The remaining brands in the top 10 for the health and hygiene industry are: Colgate, Listerine, Ivory, Pantene, Gillette, Schick, and Nivea. Both of the top brands in this category, Olay and Dove, are ranked in the Top 30 of the Brand Intimacy Study overall. Even though these two industry leaders are both widely popular and sell many of the same types of products, they approach Brand Intimacy from very different perspectives. Both brands speak to the quality and efficacy of their products, but they differ on what the purpose of those products are. Olay is dedicated to creating “Ageless Beauty”, while Dove promotes “Real Beauty”. Both messages happen to be on opposite spectrums. Natarelli and Rina Plapler, partner at MBLM, will be releasing their first book: Brand Intimacy, A New Paradigm in Marketing.